Darjeeling: The Supreme Court's denial of relief to Bimal Gurung has churned political equations afresh in the hills, with his Gorkha Janmukti Morcha rivals signalling that the verdict means the end of road for the erstwhile party chief. The entrenched Binay Tamang camp today held a meeting at Patlebas, about 5 kilometres from town, and the village that house Gurung's residence and his party office. Party sources said that the meeting held in a community hall just 50 meters from Gurung's residence, which has been locked for months, was symbolically important. "The meeting was specially held with those people who were still in a state of confusion over the turn of events," said a Morcha source. Binay Tamang in his first reaction after the Supreme Court's order on Friday was more direct. "After the Supreme Court's order, the political existence of Bimal Gurung and Roshan Giri has been wiped off." The Supreme Court dismissed Gurung's writ petition seeking for transfer of cases to independent agencies not under the control of state government and providing anticipatory bail and had also alleged biasness against the state government. Tamang said that the apex court's ruling vindicated his stand. "We welcome the court's order. The court order is a clear indication that Bimal Gurung was trying to create unrest in the region while I along with Anit Thapa was working for peace." Explaining his decision to rebel against Gurung, the Morcha president said: "People were dying; the hills were in turmoil and in doldrums. I took the decision to save our people, our community. Bimal Gurung and Roshan Giri tried to portray us as anti-people, anti-community and anti-Gorkhaland, which is untrue." Tamang said: "Those who are with him (Gurung), it is time to rethink. You can also return. Let us save Darjeeling and let us make our place better and we need your support." Sources maintain that many leaders who were with Gurung are contacting leaders of the Binay camp since last evening. Yogendra Rai, a former GTA Sabha member, also called up media persons in Kurseong to extend support to Binay-Anit camp. Perhaps rattled by the rapid development in the hills, Gurung today circulated a video message on social group. "I request all not to lose hope. This is not the end and there are other legal forums," he said. However, it is not clear if there is any legal forum left for Gurung. 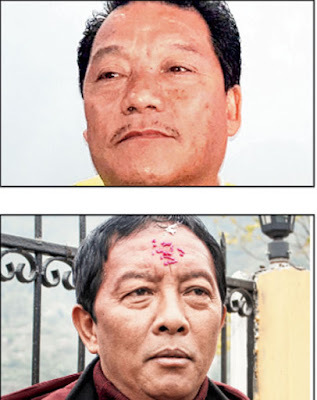 The Supreme Court's denial of relief to Bimal Gurung has churned political equations afresh in the hills, with his Gorkha Janmukti Morcha rivals signalling that the verdict means the end of road for the erstwhile party chief.